We all have a story about an animal on our place that was more than just livestock, but was a part of the family. 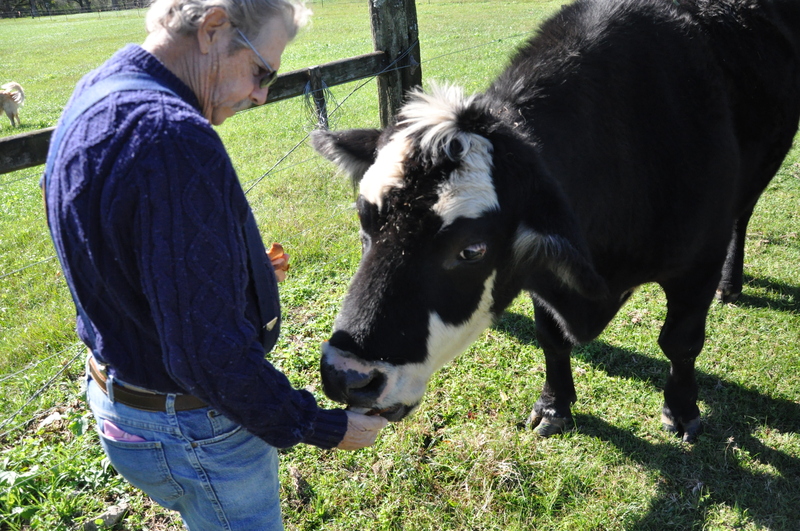 Here’s the story of Petey the lead steer and how much he brought to the Ashford farm. I shot Petey. It was not an accident but rather it was something that had to be done. This is the story of why that was such a sad event, and how much Petey added to our lives. 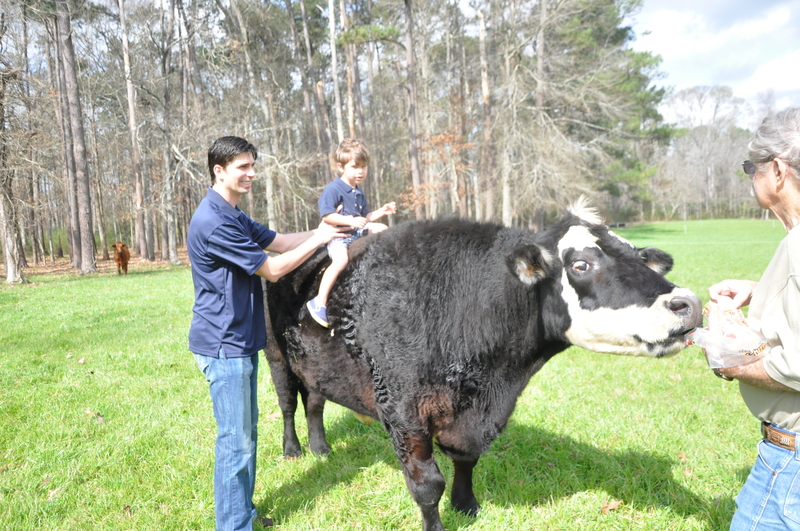 Petey was a big steer that one of our granddaughters, Kallie, left here. As a young calf, Petey arrived at the pre-conditioning outfit that Kallie and Rusty, her fellow, run in South Mississippi. He was part of a load of calves destined eventually for the feed-lot. Petey enjoying some family time. For the next few weeks Kallie and Petey established a relationship that was quite unusual on a place that usually ran several hundred head of cattle at a time. Any time that Kallie was where Petey was able to see her he would come to her. Naturally she started to pat him and talk to him and so it follows that they became buddies. Later when it became time to ship the calves that Petey had arrived with, Kallie called Robert, the man who owned them, and told him that she was going to buy Petey and not put him on the truck. Robert called her back and told her that this calf was not for sale and to load him with the other calves. Well Kallie being Kallie, she wrote the man a check for the value of the calf and when the truck pulled out Petey watched it leave. I am not really sure just what it was that happened, but one day Kallie and her fellow Rusty had a falling out and she called and said she was coming to live down here until they had settled their differences. It was no surprise to anyone that Petey made the trip too along with a herd of goats. A few weeks later Kallie and Rusty had settled their dispute and Kallie went back to Mississippi and remains happily there to this day. This is how Petey came to be here on our place. Petey enjoying snack time with Don. Now the time between Petey watching the truck leave for the feed-lot until he came to our place was several years so when he came here he was a big steer, as gentle as a pet dog and as lazy as it was possible to be and still breathe. But Petey did earn his keep. The great grand kids were able to sit on his back and they thought this was something very special to come to Grand-maw’s and visit with Petey. Petey would come to call and eat bread or fruit or for that matter just about anything edible that was offered. As previously mentioned, Petey was lazy and for the most part unconcerned with most things around him. But Petey became a valuable asset to our operation. Every year we buy calves to put out on ryegrass paddocks to graze. We use a system of Management-Intensive Grazing that requires the calves to be moved every day from one paddock to the next. For the calves this is something that must be learned and nothing can be more frustrating than trying to move 45 or 50 calves from one place to another without driving them through fences and causing a complete wreck. In our system we want the calves to follow us. This makes it easier on all of the participants in this endeavor. But the calves do not have any idea just what it is you want them to do. And this is how Petey earned his keep. We would put Petey with the calves in the pens and turn Petey out with the calves to the ryegrass. 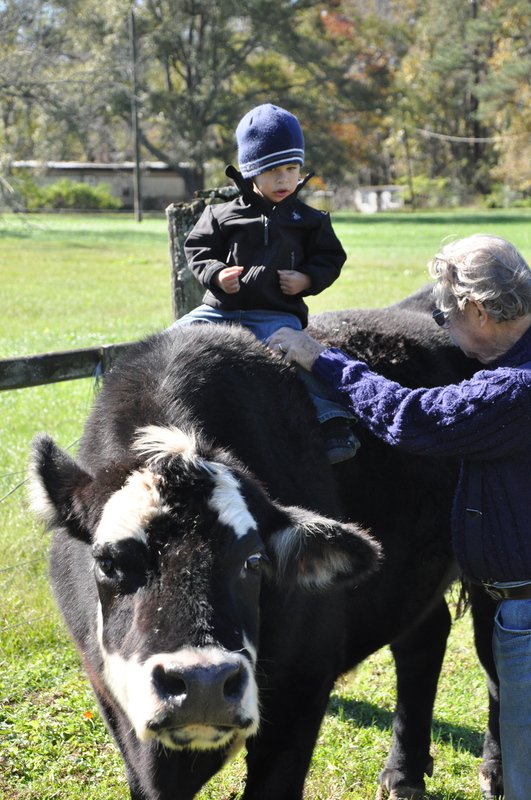 He had a calming effect on the calves because Petey got excited about very little. (The only thing that I ever found that upset Petey was to be sprayed for flies. This is the only time I ever saw Petey run.) After the first day on the grass it was time to move to the next paddock. We would begin to call the calves to us and naturally Petey would be the first to respond and after a while, sometimes longer than others, the calves would begin to come to Petey. Then the gate, which by the way was one strand of poly-wire, would be opened and Petey would walk into the next paddock and some, but not all, of the calves would follow. It then became easier to walk the calves that had lagged back into the paddock because they were simply following Petey and the other calves. But old Petey was smart. After the calves learned the drill they would come to us any time we went in the pasture but Petey would not move until he was sure we were moving to a new paddock. This year we are not looking forward to breaking a new set of calves without Petey. It can be done and we have done it lots of times. But Petey sure made it easy. The reasons that caused me to have to put Petey down are not important. We do what we have to do, but truth be told it was not the highlight of my day by any means. Those of us who work with animals understand that there will be days such as this. We dread them and it is never easy and the longer that I live the harder it gets. But we do what needs to be done. Petey was part of our family and we will miss him very much. I just wonder if those animal rights folks will ever understand the relationship that we have with our animals. I doubt it. My daughter & I call those sad times “bad farm days”. Loved the story Mr. Donnie. Great article, Don. Ours is a cow named Zoo who is definitely up there in years. Not looking forward to the day that she is unable to keep on.